By John Brooke-Little et al. Coat of Arms no 97, Spring 1976. The College of Arms, also known as Heralds’ College, is situated in the City of London. It consists of thirteen officers: three Kings of Arms, six Heralds of Arms and four Pursuivants of Arms, who are appointed directly by the Sovereign. Although it is not part of a Government Department, nor are the Officers of Arms civil servants, they are members of the Royal Household and are subject to the general supervision of the Duke of Norfolk, in his capacity of Earl Marshal. The College of Arms is thus one of the few official heraldic authorities left in the world. Since the fifteenth century at least, the English Kings of Arms have been responsible, under authority vested in them by the Crown, for controlling, confirming and granting Arms. The College of Arms is still the only official English authority for confirming the correctness of armorial ensigns — Arms, Crests, Supporters and Badges — claimed by descent from an armigerous ancestor, or for granting new ones to those who qualify for them. In Scotland, these functions are discharged by the Court of the Lord Lyon in Edinburgh, and in the Republic of Ireland by the Chief Herald of Ireland at Dublin Castle. The English heralds were first incorporated by Royal Charter in 1484 and were re-incorporated by a further Royal Charter in 1555, when they were granted the site of their present building, which they have occupied ever since. Their original house was burnt down in the Great Fire of London in 1666, but they saved all their old registers, books and manuscripts, beginning to re-build their house in 1672. 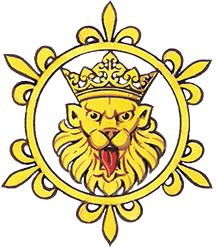 The Official Registers of the College of Arms, accumulated over the centuries by the heralds in the execution of their official duties, record not only Royal Warrants assigning armorial bearings to Members of the Royal Family, as well as to Dominions and Colonies in the British Commonwealth, or authorising changes of name and arms to individuals, but there is also a long series of registers of the armorial bearings granted or confirmed to English and Welsh families since the fifteenth century, continuing down to the present day. A further series of registers records the genealogies of many thousands of English, Welsh and Irish families, as well as a considerable number of American, Canadian, Australian, New Zealand and other families. Many of these pedigrees were recorded for people who were interested only in the history of their families and not particularly concerned whether an armorial entitlement was involved, so that all classes of the population are recorded in the College Registers, and not only the aristocracy. Heraldry, as we know it to-day, was evolved in Europe mainly during the twelfth century, as a system of devices by which the commanders of feudal armies could be identified. Its popularity grew,’ and the use of armorial devices soon spread downwards to the junior commanders, the knights and later the squires, but personal armorial devices were not used by the rank and file of the medieval army as they would have been inappropriate and unnecessary; instead, they wore the badges of their immediate commanders. Almost from their inception, armorial devices became hereditary and thus acquired aristocratic connotations. In heraldic law, one is entitled to Arms by inheritance if one can prove a direct legitimate male line descent from an ancestor who is himself on official record as being entitled to Arms. From this, it follows that not everyone bearing the same surname is entitled to the same Arms, for many individuals and families of the same name may bear totally different Arms, while others of that name may have no inherited right to any Arms. In order to assist enquirers, the Heralds and Pursuivants take it in turn to be on duty as Officer in Waiting, when they will be glad to deal with enquiries by letter or telephone, which are not addressed to a particular officer by name, or to see callers. In the latter case, the College is open to the public between 10 a.m. and 4 p.m. on Mondays to Fridays, except on public holidays. Depending on the nature of the enquiry, the Officer in Waiting will advise the enquirer, by letter or in the course of a discussion, on the most appropriate method of proceeding. In the majority of cases, a general search of the official registers of the College will be necessary, and the Officer in Waiting will inform the enquirer what fees may be involved. As each case is different from the one before, the fees naturally vary, and they are also affected by the information which the enquirer can provide about his lineage, or whether the name is widely spread or very rare. In any event, the enquirer is informed of the fees before any work is undertaken. For this purpose, the Officer of Arms consulted will require as much information on the family as may be known, such as full names of each ancestor in the line for which a search is to be made, with places of residence, dates and places of birth or baptism, marriage, and death or burial; also rank, profession or occupation and the religious denomination of the family. Not all this may be known, but as much as possible would be helpful. On the completion of the search in the official registers of the College, a report is sent to the enquirer describing what action has been taken and what, if anything, has been found. This preliminary report would not include copies of actual pedigrees, but only describes them and explains their scope and content. Should copies of such pedigrees be required, they can be provided, but a small additional fee will be payable for the work of extraction and compilation. These preliminary search reports normally conclude with suggestions for further research, if the answer has not been found first time. It must be mentioned that, when undertaking a general search, no guarantee of success can be given, for one cannot say in advance whether any record of that particular family will be found or not. If the pedigree adduced by the enquirer cannot immediately be connected with a pedigree on official record, it may be desirable to undertake further more extensive research in national and local archives outside the College. This work would be carried out with the object of finding out as much as possible about the family concerned and building up its pedigree, to try ultimately to connect this with the pedigree of a family already on record. In other cases, the enquirer may be interested only in the history of his family and not in proving a right to Arms. Here too the procedure is the same. The fees for such research naturally vary, depending on a number of factors, but it is usual to ask for a sum of money on account and to carry out as much work as possible within that limit. Here again, it will be appreciated that no guarantee of success can be given, for much depends on the state of the records to be searched, whether the family was prominent or of such humble origins that they left few records of themselves, and so on. It often happens that an enquirer wishes to have identified armorial bearings, engraved on, say, a signet-ring or piece of silver. If these are of English origin, they can probably be identified through a search of the official registers of the College, and an appropriate fee is quoted in advance for this work, depending on its complexity. If the armorial bearings are of foreign origin, it may not be possible to identify them, but the Officer in Waiting will be able to give an opinion on this. The three senior heralds, the Kings of Arms, are individually authorised by the Sovereign to grant arms to ’eminent men’ (a phrase which includes women and corporate bodies as well), subject to the approval of the Earl Marshal first obtained. Their work covers England and Wales, the Channel Islands, the Isle of Man, Northern Ireland, and the countries and colonies of the British Commonwealth. By a convention going back very many years, American citizens who can prove a direct male line descent from an ancestor who was formerly a subject of the English or British Crown, may be granted honorary armorial bearings. This also applies to American cities and corporate bodies, only in such cases the grant is termed a devisal, and the Governor of the State in which the body is situated must signify his consent and approval. The Earl Marshal has the final decision as to the degree of eminence which is acceptable for a Grant of Arms, but, broadly speaking, it is much the same as it has always been. Those whom the Sovereign has created peers or knights and companions of Orders of Chivalry would automatically qualify, as would those holders of eminent offices under the Crown. Commissioned rank in the Armed Services, or equivalent rank in the Civil Service would be a qualification, as would academic or scientific eminence, or eminence in the law or the professions, in the arts or in national or local government, or in the world generally. For obvious reasons it would be undesirable to lay down too narrow and precise a table of qualifications, as all the circumstances of a petitioner must be taken into consideration. Humble origins are no handicap; it is the degree of eminence which has been achieved that matters. The same considerations apply to corporate bodies. Apart from the armorial and genealogical work described above, the Officers of Arms can also commission heraldic art work of various kinds, either from the staff of authorised Herald Painters attached to the College, or from approved artists working outside the College. This can range from signet-ring designs, through letter-headings, company seals, presentation scrolls, to designs for architectural embellishments of an armorial nature. Here again the Officer in Waiting will be glad to discuss the problem and advise the enquirer.